Life insurance policy data interchange. PlanGen has been developing National Life Group and Life of the Southwest policy engines for independent marketing groups and captive agents since 2008. Fixed Annuity, Whole Life and Indexed Universal Life policies have been integrated into multi-person qualified retirement, welfare benefit and group life presentations for hundreds of agents and thousands of prospective clients. In the summer of 2015, PlanGen went live with a new system development that ushered in a new way of producing life policy data. 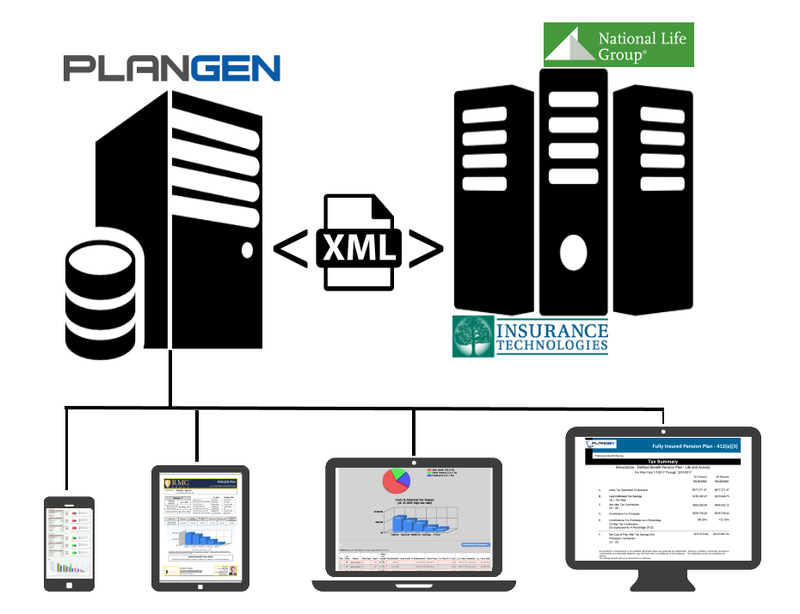 Instead of developing proprietary engines on it's own platform using carrier rate data, PlanGen began XML communication with National Life Group's web based policy system. PlanGen sends in policy design parameters for multiple lives and receive back detailed policy data and NAIC policy documents from the platform named ForeSight which is built by Insurance Technologies. NLG Policy data is packaged into comprehensive PlanGen plan presentations and delivered to advisors in a matter of seconds.